I’ve a confession to make. I’ve always found a joy in subtly sabotaging fellow players in co-operative games when the difficulty is on the down low. Stories of me shutting safe-room doors on people’s faces in Left 4 Dead, speeding off away from team mates in GTA, and holding fire as team mates breach rooms in Rainbow Six, have all circulated over the years. Most of them are true too. 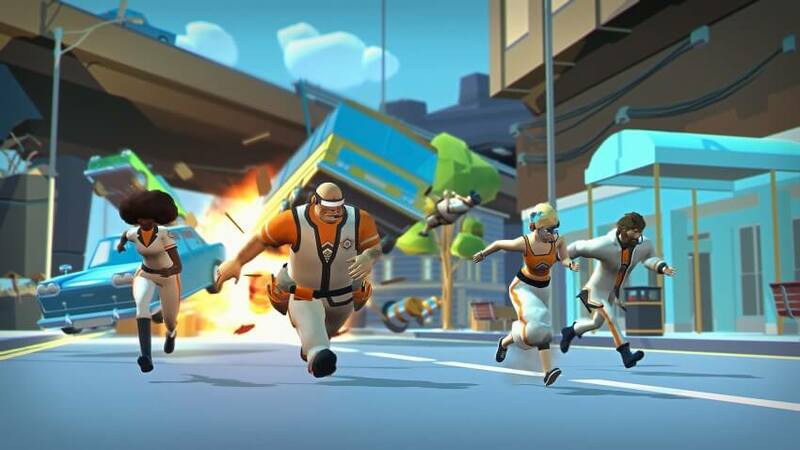 I love the idea of competitive-cooperative gameplay, and Glitchrunners really nails that, and it also adds in a further player role – The Architect – a being with sublime, sabotage skills. A panoptic trap master out to slow, and stop the runners from succeeding. At it’s core the game is a four player game about surviving a sinister, trap-ridden level, securing a power core from the middle of the level, and then getting that core to the end of the level in time. It’s a simple premise that is essentially delivering a four player version of the classic platform title, with a small crescendo event in the middle of the level. Players can, should they wish, grab items, smash containers for power ups, and push and knock one another about – be that into danger or death. The levels are rife with bombs, venus fly traps, weak supporting pillars, explosive barrels, fans, cannons, traintracks, wrecking ba… I’ll stop. There’s just over a dozen items which appear in varying quantity, mostly unique to each of the six levels. These items are all interactive through one of several means to the fifth player, The Architect. 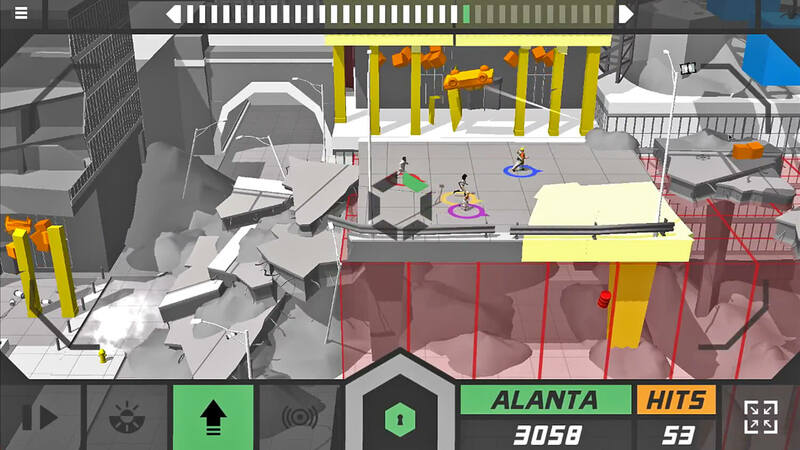 The Architect is the stand out point for the game, one of the players will take on the role of a computer guardian to the level – with a sweeping viewpoint, the ability to use items on the map, and a few special abilites. The Architect has one job, to stop the Glitchrunners, the other players, from capturing the core and/or reaching the end of the level in time. This is all done via a second screen play, with the player dialling into the local network to link up to the other, Glitchrunner, players. 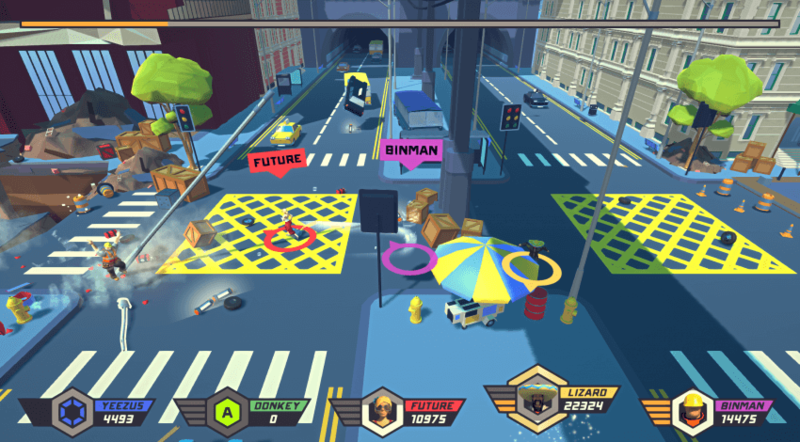 There are four different classification of items around the game world, all handily colour-coded when viewed by the architect – as you can see in several of the screenshots – the colour coding relates to how they need to be activated, or react when activated. Red items require a single press to prime, Yellow items are weak and will collapse under impact, Green items need to be held, and Blue items are moved by the momentum of the user input. This minimalist colour orientated decision makes it easy to pick up and play – I was instinctively flinging cars across levels within mere seconds of starting my time as the architect – and trust me, there’s is nothing quite like deliberately missing someone with a wrecking ball in order to then hit them straight in the face with a Jeep. The Architect’s abilities do not end there, there’s also several other abilities in their possession – Slow Time, Reverse Controls, Reverse Gravity & Generate Items. The latter, Generate Items, is probably the most interesting. It pulls more items into the world from the item database, entertainingly pulling them from any of the levels available in the game – meaning it sometimes leads to industrial crates in the wild west, or cars in the temple levels. The Architect is, to be frank, extremely over-powered, and the Glitchrunners need to run some serious interference in order to seize the core and get out of the level in time fast enough for it to be deemed a success. That said, the runners can collect small containers from around the level which give the ability to temporarily deactivate the architect by forcing them to play a small mini-game. But, even then the best tactic normally boils down to the runners spacing out, running as fast as they can and hoping the Architect is after another’s blood. Aside from the standard game mode there’s also an arena mode where players partake in a deathmatch or king of the hill mode, however, frankly, there’s little reason to play these modes considering the game’s platforming is refined and levels best experienced scrolling and erratic. There’s a few weaknesses in the game for sure, for a start the icon to generate more items into the game is a plus character which normally infers healing in games, it’s enough to cause a hesitation which is a shame. The other issue comes with the floaty jumps Set featured imagecombined with the camera angle, for the most part it’s no issue whatsoever, however there are parts where there are fast moving platforms and the characters have no ability to grab or grapple the platform should they slightly overshoot. It can be somewhat frustrating at times, especially as objects in the foreground block the view of the platform sometimes. But, this is an issue in general with platform titles, and Glitchrunners shouldn’t really be held accountable for not challenging that. The game is also entirely local play, which at events and community venues is absolutely fine – sourcing two screens and five players is perfectly do-able. However, on a smaller, residential level it’s certainly harder. The game actually comes with a second Steam code to issue to the host of your second screen while playing – which is a great, but necessary, feature. The two other ways to have managed this would be through having AI control the Glitchrunners or Architect in the absence of players (which could possibly have taken some serious resources), or implementing online match making. Either of these would have solved the issue of not being able to have a game when sitting at home alone – and would have saved the devs from giving away that free code for the game. Five, or Six, levels certainly doesn’t sound like much in the context of a platform game, but each playthrough – due to the human element – is normally massively different than previous playthroughs, and there’s even the ability to name your avatar, as well as customise their appearance. Better still there’s a randomise option on both with the latter creating some truly quirky characters, and the former pulling a name from a lengthy, entertaining list. If you regularly have friends around for co-op games, and have a second screen available to run a second instance of the game, then this is definitely something you should look into. The system requirements are quite low, so it’s worth dusting off the old laptop in order to have a few games. E.A – We have used stock images on this article due to an issue with our screen capture software at time of recording.